Extensions to Thailand, Laos, Cambodia and throughout Asia individually arranged. EXOTIC MYANMAR... THE SPLENDOR OF OLD ASIA, SEEMINGLY UNTOUCHED BY TIME... THE MAGIC OF MANDALAY, THE MAGNIFICENT TEMPLES OF BAGAN, THE BUSTLE OF YANGON. MYNMAR IS A CAPTIVATING TRAVEL DESTINATION. ASIAN ODYSSEYS has created an itinerary that is rich and rewarding. Included are major singhtseeing highlights and fascinating cultural experiences. Colorful markets, talented artisans and beautiful natural scenery await us. Isolated from modern influence for decades, each element of this journey offers an opportunity for an exciting and fulfilling adventure. The joy and optimism of today's events make this a perfect journey. With a focus on the culture, people, arts and sights of Myanmar, we will see fairy tale pagodas, fascinating architecture and lively street llife. We will stay at deluxe boutique hotels and enjoy gourmet cuisine. 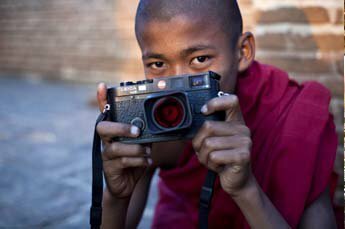 Guides are carefully chosen for their wealth of knowledge and their ability to help us understand Myanmar's diverse cultures and sights. The warmth and hospitality of the local people will make this journey memorable. This is an ideal time of the year to visit Myanmar, with near perfect weather. Join with a small group for a trip that is exciting, exotic and fun. 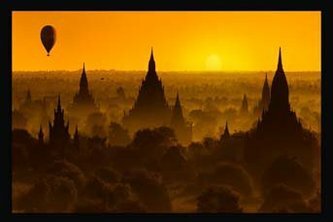 CUSTOMIZED EXTENSIONS BEFORE OR AFTER THIS JOURNEY TO MRAUK U, MYANMAR, ANGKOR COMPLEX, CAMBODIA, LAOS, THAILAND, INDIA, AND BEYOND. Upon arrival in Yangon, you are met by our Agency representative and tour guide at the airport and transferred to our historic Victorian-era hotel, The Strand, where our luxury suites await. Formally known as Rangoon, current-day Yangon is a bustling and charming city. Rest of day at leisure to rest and recover from Jet lag. Following breakfast, tour the highlights of the city. Enjoy a private tour to visit the key sights of Yangon with its old colonial-style city center, bustling markets and majestic temples. A “heritage” walking tour of downtown includes a visit the Sule Pagoda and the colonial era buildings in city center. Stop for an overview of Scott’s Market (Bogyoke Market). Visit the 100+ years-old beautiful Rangoon Synagogue and meet with Moses Samuels, the trustee of the synagogue. No visit to Yangon is complete without a visit to the National Museum, followed by the highlight of our trip: the Shwedagon Pagoda. Nothing will prepare you for majesty of this complex, with its glittering gold stupa. At the pagoda we observe local pilgrims and monks offering their devotions amidst the dazzling golden spire glowing with the reflection of the setting sun upon its bejeweled crest. Reflect on your day and enjoy a gourmet dinner at Agnes - a magnificent French restaurant with outstanding views of the shimmering Shwedagon. After breakfast this morning, fly from Yangon to Bagan and begin your exploration of the temples. You will visit a diverse selection of the most important pagodas and temples in this UNESCO World Heritage Site, such as Ku Byauk Gyi, with its exquisite murals and Ananda Temple, a whitewashed masterpiece of Mon architecture. Check in at the hotel in the late morning. Lunch at a local restaurant overlooking the Irrawaddy River. A visit to lacquer craftsmen and workshops in nearby Myinkaba village includes meeting with Aung Mying, a laquerware artist world-renown for producing pieces of exceptional quality- and written about in the book: Burmese Laquerware. Sightseeing continues with visits to Manuha Temple, Nanbaya Temple, and Myingaba Gu Byaukgyi Temple. In the late afternoon, you’ll explore the villages and temples of Bagan by horse cart, for those who wish, or spend some time enjoying the superb facilities at the Resort. Sunset atop one of Bagan’s ancient monuments. Dinner will be poolside at your magnificent resort. Today is a unique opportunity to see the ancient city of Bagan from a different perspective. 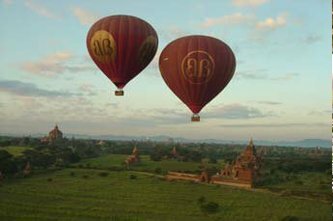 From a hot air balloon, (optional), get a magnificent aerial view of thousand-year old pagodas and temples and rural villages nestled along the Irrawaddy River as you glide aloft for about an hour. A champagne celebration concludes the adventure. We return to the hotel for breakfast. Around noon you embark the luxurious Anawrahta, berthed at the quay of Bagan. After a warm welcome by our staff offering some refreshments you move into your “home” for the next days. Taking its name from the glorious sunsets that turn Myanmar's evening skies golden, this cruise calls in at small riverside villages, the bustling trading town of Pakkoku and the rapidly modernizing city of Mandalay. From beautifully carved teak monasteries and traditional pottery-making to newly constructed high-rise buildings; see ancient Burma and 'Brave New Myanmar' side by side in a country undergoing a transformation. With the largest cabin space on the Irrawaddy River, and the highest crew to passenger ratio, Anawrahta offers the finest on-board experience in Myanmar. This impressive vessel is named after the founder of the Burmese nation, the modern-day Myanmar. During his reign, from 1044-1077, he introduced and spread the religion of Theravada Buddhism throughout the land. Blending the purity and serenity of King Anawrahta’s Buddhist beliefs with the opulence of the British Empire, Anawrahta is the perfect vessel on which to explore Myanmar’s mighty Irrawaddy River. Built to resemble a British colonial paddle steamer, the elegant 65-meter/ 214 feet long Anawrahta features three spacious decks and 23 luxurious cabins. With its gleaming white rails, polished lacquer, intricately carved woodwork and shining brass, Anawrahta takes guests back in time to an era of bygone elegance. Irrawaddy. Right before the arrival you see the longest bridge of Myanmar (Pakkoku Bridge). On shore the tour takes us to some of the small industries in this area, such as a cheroot-rolling factory and a producer of ‘Burmese slippers’ (“flip-flops”). A visit to the thriving market gives us an insight of the local goods and trading. wood. It also houses a unique Buddha image seated on a lotus throne. whiff cigars and ladies sip on tasty gins with tonic. Dinner is served at the Hintha Hall, followed by an open-air cinema under the stars on the sun deck. For early morning risers there is the opportunity to participate at a yoga session on the sun deck. The next stop is Yanderbo. While having breakfast the ship passes the confluence of the Irrawaddy and its greatest tributary, Chindwin River. We arrive at the quiet, small riverside village of Yanderbo. A unique and fascinating gem of a village, where in 1826 the King of Ava signed the Treaty of Yanderbo, signaling the end of the First Anglo-Burmese war. Nowadays the villagers produce a type of water pot which is reputed to keep water cooler than pots from anywhere else in the country. Their techniques and skills to produce a variety of pots and utensils are unique. Anawrahta’s knowledgeable guides offer insightful information as we stroll. On foot, we explore the village. You quickly notice that the villagers here are extremely friendly, charming and open to talking with us, which makes the trip so interesting! Back on board a delicious lunch buffet awaits you. The ship continues its journey northwards. Gaze on the river banks of this eternal stream from your lounge on the sun deck, in the pool, or alternatively, book a spa treatment. Dinner is served in the Hintha Hall. In the morning our yoga class helps to get in the right form for a day. Enjoy a leisurely breakfast as the ship sails northwards to Ava. Back on board, a feast of lunch buffet is served and Anawrahta continues the cruise northwards, eventually arriving at the utmost highlight of this journey - Mandalay. Take some time to observe the beautiful Sagaing Hills with thousands of scattered pagodas while the ship is passing by. We will dock at Mandalay at the early afternoon. process of the gold-leaf beating, visit a silk-weaving workshop and have a stroll through the amiable streets hosting many marble-carving workshops. 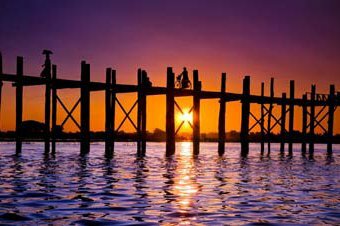 The ultimate highlight of this day is a sunset cruise in a small rowing boat around the famous 200-year-old “U-Bein Bridge”- a photographer’s dream. We wistfully return to the boat. Before dinner you are invited to watch a traditional dance and music performance by students and teachers of the Mandalay Art School. Today we have an amazing discovery tour of the most impressive pagodas of Mandalay during a morning tour. 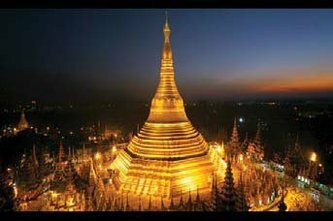 First, we visit the Kuthodaw Pagoda, which is known as the “the world’s largest book”. This pagoda consists of a gilded pagoda with hundreds of shrines housing inscribed marble slabs detailing the sacred Buddhist texts. We continue to the Mahamuni Pagoda, which is one of the most important Buddhist pilgrimage sites in Burma and houses the most highly revered Buddha image in the country. Last but not least, visit the atmospheric Shwenandaw Monastery, which is maybe the finest examples of traditional 19th century wooden monastery buildings. It used to be part of King Mindon’s Mandalay Royal Palace. From this elevated point, we can overlook the entire city of Mandalay. We return to the ship and have lunch while Anawrahta sets sail to the site of Mingun. Mingun showcases the monumental, unfinished stupa of King Bodawpaya. It has never been completed, due to an astrologer’s claim that once the temple would be completed, the king will die. Via a relaxed walking tour, (or oxcart “taxi”), we explore this sleepy village and reach the world’s largest un-cracked bell, weighing 90 tons. After breakfast your stay on your floating, luxury home regrettably ends. Transfer to airport for a short flight to Heho- then drive to Kalaw. Kalaw was a Colonial hill station town, surrounded by pine trees and forests. Nearby are villages of the Palaung and other hill tribe people whom you will see in the market in colorful ethnic dress. The population is a mix of Shan, Indian Muslim, Bamar and Nepali. Here is your best opportunity to do a day of soft trekking around the villages. Your guide will take you through trails and villages: Palaung and Pa-O tribes inhabit the area surrounding Kalaw. Intha, Shan, Taung-yo, Danu and Kayah people live in the mountainous area north and east of the town. The book “The Art of Hearing Heartbeats” is set here in Kalaw. Take some time to explore the attractions of the town as well. After breakfast, we will have a scenic drive from Kalaw to Inle Lake. Known as the most beautiful lake in Myanmar, Inle Lake's calm waters are surrounded by high hills and dotted with floating gardens and stilted villages. You will drive to Nyaung Shwe-, stopping at a magnificent monastery and school outside of town before you reach the jetty where you board your private boat for a 30-minute ride to the hotel, located on the shores of the lake. Your guide will take you to visit a farm village, time permitting, to visit a family in their house on stilts in the lake and travel by small canoe through the floating farms. This morning will be spent exploring beautiful Inle Lake. Begin your sightseeing in Inle Lake, maneuvering by boat though long, scenic channels. Visit the fascinating village of Indein, with its complex of ancient shrines and stupas and walk though exotic colonnades of stairways and shop stalls. Following lunch overlooking the river, take an easy trek thoough the local villages… an “off the beaten track” experience. 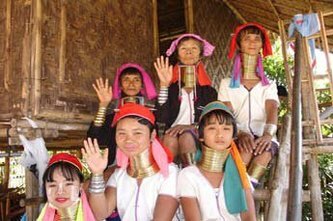 Visit the “long neck” tribal women, in their workshop and weaving and craft villages perched on stilts. See the lake’s unique “leg rowers” – the Intha people row standing up with one leg wrapped around an oar. Dinner own account at Hotel. the stores to fully experience the Burmese market atmosphere! Extensions can be arranged to meet your individual travel needs throughout all of South East Asia. -Pre-departure materials, including a Travel Guide with background information, packing list,medical information and reading list. Departure Gift. Asian Odysseys acts as a consultant for the owners or contractors providing the means of transportation, hotels, and other services. Asian Odysseys helps to plan the itinerary, provide travelers with pertinent information, serve to communicate between the traveler and provider of services, and transmit payment as a courtesy to travelers. No responsibility or liability is assumed for any act, error or omission or for any injury, damage, loss accident, delay or irregularity which may be occasioned by reason of any defect in any vehicle, or through neglect or default of any company or person engaged in conveying the passenger, or for any proprietor, or for any other person engaged in carrying out the purpose for which tickets or vouchers are issued. Airlines and other carriers are not responsible for any act, omission or event during the time passengers are not aboard their planes or conveyances. Asian Odysseys and or the passenger-associated companies accept no responsibility for losses or additional expenses due to delays or changes in flights, train, or other services; sickness, weather, strikes, war, quarantine, accident or other causes. Additional expense, if any, shall be borne by the passenger. Your booking and payment constitutes agreement with this policy. This trip features luxury, boutique hotels, chosen for their traditional style, comfort and amenities, and architectural features. These hotels add immensely to the enjoyment of the trip. Due to the small group size, we have pre-booked the hotels indicated and are assured of our reservation. GROUP SIZE: Groups are limited to 12 participants, maximum, to create opportunities for experiences not otherwise possible with a larger group. Departure is guaranteed. LEVEL OF DIFFICULTY: Easy to moderate touring. Some moderate day walks, excursions in horse carts, trishaws, and small boats. WEATHER: At this time of year, the weather is the best in Myanmar: no rainfall expected, sunny days- with temperatures ranging from 50-60 F at night to 85F during the day. In Inle lake, early mornings and late nights are chilly. POLITICAL SITUATION: The areas covered in this tour have been stable, and warm and receptive to tourists. The new openness and desire for more Western contact will result in changes, making this the perfect time to visit Myanmar while the combination of new freedoms and old “timelessness” creates an exceptional tourist adventure. FOOD: Burmese cuisine consists of fresh vegetables, meat, chicken and fish, “stir fried”. Special accommodations can be made to accommodate specific dietary requirements with advance notice. Specific information about packing, a reading list, extensions and optional ballooning, shopping, money issues, visas, etc will be provided in advance of the trip. in Asia available upon request.